Tesla Inc is recalling 11,000 Model X vehicles that were built between October 28, 2016 and August 16, 2017 due to issues with the second row seats. Model X is Tesla’s crossover EV that first started being delivered to customers in September 2105 after an initial delay of about three months. To date it has sold around 20,000 units. The cheapest Model X variant, the 75D, is priced at $79,500 in the United States. The P100D at the top end is available for $140,000 cash. According to reports, the issue only affects about 3 percent of the 11,000 recalled crossover SUVs. The issue is a minor one that can be fixed in about 10 minutes and has to do with seat cables in the second row. So far, Tesla says it has not received any customer complaints about the issue. Tesla has started to inform Model X owners about the recall, and they can contact Tesla’s mobile repair units or visit a dealer to get the issue fixed. Though recalls are not something to be surprised about as cars are complex products with thousands of parts, the last few weeks has been extremely testing for Tesla. The company failed to meet its own Model 3 production targets, and then the Wall Street Journal said the production bottleneck was caused because parts of the car were produced by hand, throwing a huge question mark over future production numbers. Moreover, the stock price has been edging lower since the middle of September, and now we have the recall issue popping up. 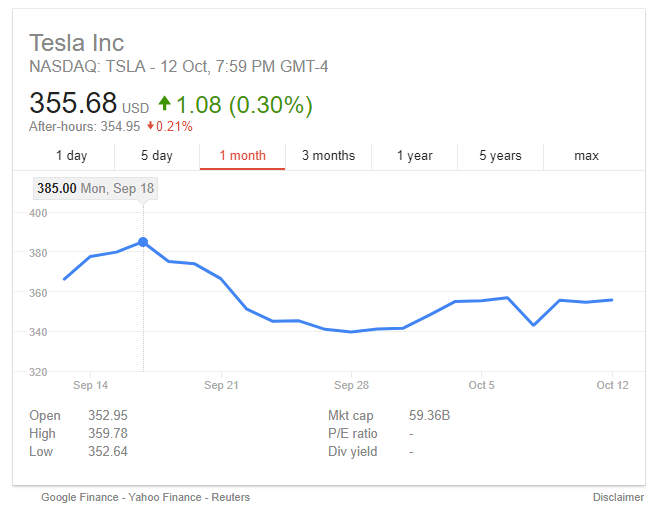 Tesla is sure to be hoping this month ends as quickly as possible.